Conor McGregor is a man who has succeeded and fulfilled his dream. 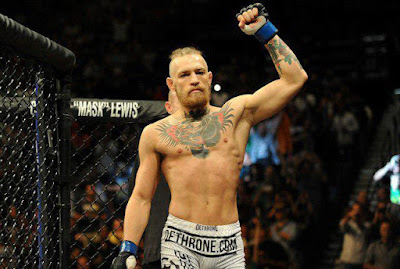 The Irish fighter Conor McGregor is considered to be the black-and- white thinker in the world of mixed martial arts. He is a blusterer with toxic personalities who`s not used to meet half away. Today he is supposed to be the most dangerous fighter in conjunction with his traits. In McGregor`s younger days, the whole world talk about his path to success. Above all things, Conor likes to defeat his opponents. He is ready to defeat this leadership through his range of techniques. He was already named “The notorious” and “Conor the Barbarian” in professional circles, which characterize him a lot. “I didn`t want to practice sport just for fun. My aim was to show the world, that I`m special”, Conor said. Conor McGregor was born in 14 July 1988. Being a teenager, he was fascinated with sport and started to play football. McGregor managed to get his first victory in the prestigious “Luders Celtic” team. It was really difficult to get in this team and stay there. As Conor told later, good training and dedication aren`t enough. You must have daily desire to become better and improve your skills every day. Just during that time he showed his basic traits of character and the aspiration to achieve perfection, which subsequently led him to Olympus of glory and success. However, he decided not to become a professional football player, because he considered himself to be a unique and bright personality, who shouldn`t put the interest of the team above his own. He wanted public to see he can achieve everything by his own because he is fully responsible for his actions. Gradually he began focus on martial arts. He wished to prove everyone that he is really capable to fight. At the age of 16 he began to participate in competitions, as a part of “SBG” team. Today Conor is remembered as one of the greatest representatives of this team. Conor was ready to become a winner while another only started to plan their life. Later McGregor began to perform under the aegis of UFC in a lightweight division. At that time, nobody could suppose Conor would become a champion, because he had quite lean and withy constitution. When you see the characteristic of his fight, burning eyes and his behavior in general you understand that he needs only a victory and nothing more. Two defeats in the beginning of his career fell behind. And then he won streak of 8 victories. The spirit is extremely important, in addition to numerous hard trainings. The fighter must be sure about own win, moreover the opponent has to admit it, he must feel it. It should be your mental states, confidence that flew through your veins. “Conor certainly has the strongest mental training I have ever seen. He is truly able to get in the mind of opponents and change their thoughts”, the coach of the fighter said. Every path to success begins with simple actions which you start to do every day with the very first step. Maybe, you will doubt from the fact that nothing changes reaching the thousandth step. Unfortunately, there is no opportunity to find out when these changes will happen. You will be successful if you stubbornly move forward and reject the idea about submission. Your success looks for you and that`s why you shouldn`t give up, otherwise it will find someone else. When Conor McGregor was 20, his salary was 235$. This money he received not for the participation or for victory in fight. It was an unemployment benefit. But McGregor didn`t give up. Moreover, he continued his trainings two times a day. Nowadays he earns about half a million of dollars when he fights. He has achieved it through his faith in himself which he managed to inculcate to the whole world.